100% Genuine Apple 2M Lightning To USB Charger Lead Cable For iPhone 6 6S 7 8 X XS BRAND NEW QUALITY USB SYNC & CHARGER DATA LEAD CABLE FOR APPLE IPHONE 8, 8, 8P, X, 10, 7,7P, 6,6P, 5 5C 5S IPAD 4 AIR MINI Fully support iTunes, Data Syncing and Battery Charging. Supports all iOS Software Versions including iOS9 to iOS12.1.2 High-speed data transfer as well as charging via Plugs, Laptops and Car adapters. Premium Quality design fits all aftermarket cases & accessories. Colour: White High-speed USB 2.0 COMPATIBLE WITH Apple iPhone X / 8 / 8 Plus / 7 Plus / 7 / 6s Plus / 6s / 6 Plus / 6 / SE / 5s / 5c / 5 / iPad Pro / iPad Air / Air 2 / iPad mini / mini 2 / mini 4 / iPad 4th gen / iPod Touch 5th gen / iPod nano 7th gen. BUY WITH CONFIDENCE 100% MONEY BACK GUARANTEE IF NOT SATISFIED. 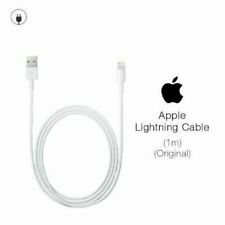 100% Genuine Apple Logo Lightening USB Cable For iphones & ipads 2m Length. Condition is New. Dispatched with Royal Mail 2nd Class Large Letter. 1 x 2M cable. For sale is a 2M apple Foxconnmanufacturedlightning cable. We will continue to test each new batch we get to ensure they are genuine. We invested in this diagnostic device shown in the photo (not included), just so we can check every single cable that leaves our office! Genuine Original Official SC Apple iPhone X/8/7/6S/6 /5S Charger USB . Condition is New. Dispatched with Royal Mail 1st Class. Lightning to USB Cable (1m). Compatible with: Any iPhone with Lightning Port. (MQUE2ZM/A). 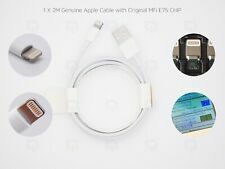 100% GENUINE & ORIGINAL OFFICIAL Apple iPhone X/8/7/6S/6 /5S Charger USB Cable. Condition is New. Dispatched with Royal Mail 1st Class Large Letter. Replacement Apple 2M Lightning USB Charger Lead Cable For iPhone 5 6 7 8 9 X series (Generic) This 2-metre USB 2.0 cable connects your iPhone, iPad or iPod with Lightning connector to your computer's USB port for syncing and charging. Or you can connect to the Apple USB Power Adapter for convenient charging from a wall outlet. Iphone USB Charging / Sync Cable. Ipad Mini 1/2/3/4, Air 1, Air 2. e.g Iphone 5/5s/se/6/6 /7/7 /8/Plus Models. 2x Genuine Apple iPhone X/8/7/6S/6+/5S Charger USB Cable 1m. For iPhone 6s Plus, For iPhone 6s. For Apple iPhone 6s. For Apple iPhone 6s Plus. For Apple iPhone 5s. For iPhone 6 Plus, For iPhone 6, For iPhone 5s. For Apple iPhone X, For iPhone 7. :For Apple iPhone SE. · iPhone 6S. · iPhone 6S PLUS. quanty: 3pcs. Apple iPhone 5 5S 5G 6 6 PLUS 7 7PLUS 8 8 PLUS & IPHONE X iPAD AIR 1, 2. IPAD 3 & 4. 100% GENUINE ORIGINAL OFFICIAL TN USB CABLE For Apple iPhone iPhone iPad. (2) Tinned copper wire core. 4) High speed of data transmission. USB 2.0 IOS cable for Apple iPhone, iPod, iPad etc. Connect your device to computer via USB port for efficient syncing and charging. Don't settle for less, get the original designed by Apple California. For iPhone 5, 6, 7 all s & plus. UK Standard 3 Pin Plug. If you are not satisfied when you receive your item. Best value for money. This USB 2.0 cable connects your iPhone, iPad, or iPod with New connector to your Mac or Windows PC' USB port for syncing and charging or to the Apple USB Power Adaptor for convenient charging from a wall. Please Note : This is a true Genuine Cable purchased from UK Distributors with a full audit trail. If an Apple cable is sold for less than £4 online then its probably not authentic. Supports All IOS Systems Including IOS Made For - IPhone 5 - IPhone 5s - IPhone 5c - IPhone 6 - IPhone 6 Plus Iphone 6s -Iphone7-iphone7plus-iphone8-iphone x- IPad Mini - IPod Transfer & Synchronize Data - Videos - Music - Contacts - Apps From IPhones - IPads - IPods Using PC & Laptop Synchronize & Charge IPhone - IPod At The Same Time Length - 1 Meter Cables are serialised and Bar coded. Sealed in Clear Packaging. Usual Service from DSG Europe LTD.
Apple iPhone X / 8 / 8 Plus / 7 Plus / 7 / 6s Plus / 6s / 6 Plus / 6 / SE / 5s / 5c / 5 / iPad Pro / iPad Air / Air 2 / iPad mini / mini 2 / mini 4 / iPad 4th gen / iPod Touch 5th gen / iPod nano 7th gen.
Super Purity Copper conductor, Ensuring a high quality. 100% the harmless zero odour. 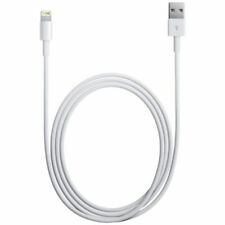 You will Get:- 1x Genuine Apple IPhoneUSB Charging Sync Data Cable. 2 This cable used for dual purpose both for charging and data sync. IPhone 6S. iPhone 6S Plus. This USB 2.0 cable connects your iPhone, iPad, or iPod with New connector to your Mac or Windows PC' USB port for syncing and charging or to the Apple USB Power Adaptor for convenient charging from a wall. Apple iPhone : X ,8 Plus 8, 7 Plus,7,6S Plus 6S, 6 Plus,6, 5S,5C. Works with all Apple devices. This white cable is a genuine Apple iPhone Lightning, with a handy 1m length to ensure a convenient reach. Compatible with the iPhone 5, 6s, 6, 7, 5c, 6s Plus, 6 Plus, and 7 Plus. Type USB Cable. Cable Length 1 m.
Apple Lightning to USB Cable. 1x Super Top-Notch Lightning to USB cable. Fits like a glove. It also has a lovely white finish. 100% Genuine RRP £29. We will continue to test each new batch we get to ensure they are genuine. 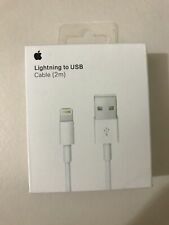 For sale is 2 2M apple Foxconnmanufacturedlightning cable. We invested in this diagnostic device shown in the photo (not included), just so we can check every single cable that leaves our office! IPHONE 6 PLUS. IPHONE 6S PLUS. IPHONE 7 PLUS. IPHONE 8 8 PLUS. IPHONE X XS MAX XR. IPHONE 8 PLUS. 100% GENUINE. IPOD TOUCH. High quality 2M cable perfect for use at home, at work or in the car. IPhone 6s & 6s Plus. iPhone SE, 5s, 5c, 5. 12 MONTHS WARRANTY 100% FLEXIBLE APPLE I PHONE CABLE. iPhone 8 & 8 Plus. iPhone 7 & 7 Plus. iPhone X, XS, XS Max. iPhone 6 & 6 Plus. It would be very much appreciated. The Apple Lightning cable connects selected iPhone, iPad and iPod models to your computer for ultra-fast device synchronisation. For iPhone, iphone, For iPod Touch 5 5th Generation, ipad, ipod, For iPhone 5, For iPhone 5c, For iPhone 5s, For iPhone 6, For iPhone 6 Plus, For iPhone 6s, For iPhone 6s Plus iPhone 7 iPhone 7 plus iPhone 8 iPhone 8 plus. Replacement Apple 1meter Lightning USB Charger Lead Cable For iPhone 5 6 7 8 9 X series (Generic) This 2-metre USB 2.0 cable connects your iPhone, iPad or iPod with Lightning connector to your computer's USB port for syncing and charging. Or you can connect to the Apple USB Power Adapter for convenient charging from a wall outlet. IPhone 5/5S/5C/SE/6S/6 /6S/7/7 /8/8 /X iPad 3/4,iPad Mini iPod Touch. IPhone 6S, iPhone 6S Plus, iPhone 6, iPhone 6 Plus, iPhone 5,iPhone 5S,iPhone 5C. This USB 2.0 cable connects your iPhone, iPad, or iPod with New connector to your Mac or Windows PC' USB port for syncing and charging or to the Apple USB Power Adapter for convenient charging from a wall.